More than 100 well-heeled diners are sitting in the august British Library in London, eating a fennel slice, an olive and a kumquat while stroking pieces of velvet, silk and sandpaper. The scent of cloves wafts around the room as an airplane engine roars. And this is just the appetizer. The main course of this unusual banquet is "Alaskan Salmon in the Rays of the Sun With Mars Sauce." Dessert is Elasticake, a fluffy pastry ball oozing blood-red zabaglione and crowned with quivering licorice antennae. Welcome to the weird, sensory world of the Futurist Banquet -- an eccentric but strangely influential combination of culinary experiment, political statement and artistic stunt served at the library recently for an assortment of food lovers, artists, academics and diplomats. The menu was based on the 1932 "Futurist Cookbook" [link] by Italian writer Filippo Tommaso Marinetti, a combination of radical manifesto, practical joke and recipe book whose dishes include chicken with ball bearings, salami cooked in coffee and eau de cologne, and the enigmatically titled "Carrot + Trousers = Professor." "Futurist food is a revolution," said Lesley Chamberlain, editor of the cookbook's English edition. "The 20th century is a century of revolutions. This is perhaps the funniest one, the one you have to take least seriously -- but one we are still living with." Marinetti coined the term "Futurism" for the art movement he founded in 1909. Intended as a celebration of modernity and a rejection of romance and sentiment, it was dedicated to modernity and speed, to the violent, the urban and the mechanical. Its followers were famed for playful, provocative pranks and manifestos -- and, less appealingly, for an uneasy but enduring allegiance to the Fascist movement led by Benito Mussolini. For the Futurists, food was about art, not sustenance. A meal should be a feast for all the senses, as well as a rejection of bourgeois values. Marinetti was the sworn enemy of comfort food -- he caused a sensation by proposing that pasta be banned on the grounds it promoted "lethargy, pessimism, nostalgic inactivity and neutralism." Turning Marinetti's exuberant vision into an edible meal was a challenge, said Giorgio Locatelli, the Michelin-starred London chef called in to oversee the dinner. Real-life Futurist banquets held in the 1930s were raucous affairs in which food was often secondary to sensation. "We did a lot of reading, and it seemed like one guy would cook a meal for six or seven people, and 200 people would turn up," Locatelli said. "So there was no food at all -- just people drinking and then beating each other up at the end." Marinetti's cookbook includes descriptions of various dishes, as well as descriptions of meals appropriate to various occasions. For lovers, Marinetti suggested a cocktail called War-in-Bed, "composed of pineapple juice, egg, cocoa, caviar, almond paste, a pinch of red pepper, a pinch of nutmeg and a whole clove, all liquidized in Strega liqueur." Soldiers about to go into battle should eat "raw meat torn by trumpet blasts." The recipe begins: "Cut a perfect cube of beef. Pass an electric current through it, then marinate it for 24 hours in a mixture of rum, cognac and white vermouth." In adapting Marinetti's freewheeling ideas for the table, British Library organizers were forced to strike a balance between the avant-garde and the edible. Curator Stephen Bury said he regretted the absence of chicken with ball bearings. "But we thought, 'Oh God, the liability if someone choked.' 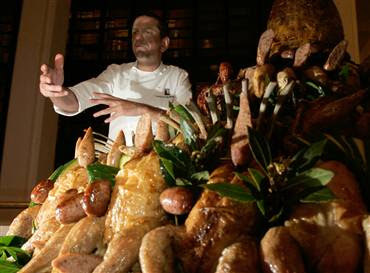 "
Entering the dining room, guests passed a carne plastica, or meat sculpture -- a towering pyramid made from 36 chickens, assorted guinea fowl, chunks of lamb, beef and sausage, topped with a honey-glazed tumulus of minced beef. Courses were served by waiters in striped flannel pajamas. Salmon with Mars sauce turned out to be an inoffensive piece of fish with a sauce of anchovies, capers and pesto, and was dismissed as "boring" by one diner. Almost everyone agreed the Elasticake was delicious. Other elements were more unsettling. After the appetizer, diners were ushered away from the table by a man with a megaphone and herded downstairs to chew on rice balls while listening to Futurist tracts read out in Italian and English. Futurism and other avant-garde movements such as Surrealism and Dadaism have had a well-documented impact in the arts, visible in everything from the paintings of Salvador Dali to the free-associating slapstick of the Marx Brothers. Futurism's influence on the way we eat today is less obvious. But traces of it can be seen in nouvelle cuisine, with its focus on tiny portions and artistic arrangements. Marinetti's declaration that scientific principles should be used in the Futurist kitchen is reflected in the "molecular gastronomy" practiced by acclaimed chefs such as Britain's Heston Blumenthal and Spain's Ferran Adria. And his anti-pasta stance finds an echo in today's low-carb diets. "A lot of the things these people talked about, like the tactile sensation of the food, are things that chefs today talk about," Locatelli said. "And it's true that Italians tend to overdo it a little on the pasta. I agree with that. So the idea of a varied diet was very forward-thinking at the time." ~Jill Lawless, "Futurist Banquet blends the avant-garde, edible", The Associated Press (The Oregonian), 15 April 02008. This particular event was part of the British Library's exhibition "Breaking the Rules". Its curator, Stephen Bury, blogged on the event here: "I was expecting a gimmick but I curiously started to perceive the food differently. [...] It's a fantastic evening." Tickets ran £75 each, "including all food, wine, cocktails and other distractions". It's amusing to me that this rather lavish effort sought to recapture a genre of 01930s dinner party aimed at the "rejection of bourgeois values" (so, maybe that phrase meant something different back then). A 02003 article at Cabinet magazine explains that the Italian Futurists weren't above a little hypocrisy: at "a banquet for 300 people held on 18 December 1931 at the Hotel Negrino in Chiavari. [...] Although the Futurists had advocated the abolition of eloquence and politics around the table, the guests nevertheless first had to sit through a lecture by Marinetti on the state of world Futurism." Why does that kind of irony seem so eerily familiar? In part, it could be a lingering effect of the movie I just screened tonight for the EWC classic movie program (previously mentioned here), Terry Gilliam's Brazil. There's a great scene where Jonathan Pryce's hapless character Sam Lowry finds himself in a fancy restaurant with his vain, cosmetic surgery-obsessed mother. Their haughty French waiter insists that each dish be ordered by number only, and the food arrives in revolting piles of processed mush, with a photograph of the real food you were expecting planted on a little stand in the middle of the plate. Ultimately, Marinetti believed, modern science would allow us to replace food with free, state-sponsored pills composed of albumins, synthetic fats, and vitamins that would lower prices for the consumer and lessen the toll of labor on the worker. Ultraviolet lamps could be used to electrify and thus dynamize food staples. Eventually, a totally mechanized production would relieve humankind of labor altogether, allowing man to be at leisure to pursue nobler activities. Dining could thus become a purely aesthetic enterprise. ~Romy Golan, "Ingestion / Anti-Pasta", Cabinet, Issue 10, Spring 02003. It's curious and quite troubling to note how (what Golan characterises as) an expectation that speed, mechanisation and standardisation would herald workers' liberation came to be turned on its head. (Indeed, the whole movie Brazil is a requiem for the freedoms and dreams sacrificed at the altar of the modern -- the entrapment of the worker.) History's revenge: the promise that the Futurists discerned in mass produced synthetic foods has been disintegrating -- Fast Food Nation, anyone? -- with Italy, of all countries, the centre of the Slow Food movement protesting against it. Very rarely, yet still occasionally, art history types get us postwar social change-watching futurist types confused with these prewar fascist Futurist types. (I'm not sure if I'm adding to or lessening the confusion with this post.) Let me be clear: I'm no fascist, but I love the banquet idea. It's not quite the fanciful, absurdist aspect of it that gets me -- although that's fun -- so much as the attempt to create a parallel experience, outside of our reflexes, that is attentive to all sensory details. Jake Dunagan and I have been talking for a year or two now about a futures dining event, an immersive, experiential scenario where apparently impossible future foods are served (a timely but non-essential example could be in vitro meat, as reported in the New York Times this week). It would aim to be considerably less disgusting than the restaurant scene in Brazil (or the Chinese restaurant in David Cronenberg's eXistenZ); more attentive to food than theatre in contrast to Tony and Tina's Wedding; and more grounded in emerging possibilities for food consumption patterns -- with respect to changing tastes as well as shifting availability of ingredients -- than the artful fripperies of the Futurist banquet... but nonetheless, an immersive scenario intervention to get you right in the stomach. Hello, I’m Zena and I don’t want to eat food pellets. I’m writing from becker&mayer! books in Bellevue, WA. I’m working on a proposal for a series of children’s books about the future. These will have real information (or, things that really are predicted by futurists) and imagined details. For example, futurists predict a TV-wristwatch; we invent the reality show kids will watch on that wristwatch-TV. I’m looking for someone in the field of future studies to help us brainstorm ideas for the books. If you are interested, or you know someone who might be interested, please email me at zenac@beckermayer.com. PS: sorry for leaving that long email in your comments section. You can delete it after you read it. Hi, Zena! Thanks for stopping by. I don't want to eat food pellets either. Your book series sounds like a fun project -- I'll get in touch by email. Stuart, wanted to send along some menu items for your proposed banquet with Jake, courtesy of Critical Art Ensemble in their book The Molecular Invasion. Check out the Green Fluorescent Protein dishes! Also of interest? Food Hacking. Fatigue, irritability, and much, much more!